There’s snow on the ground but winter isn’t going to last forever, spring fashion helps me get into the mood of warmer days. This post is sponsored by Everywhere Agency on behalf of OshKosh B’gosh; however, all thoughts and opinions expressed are my own. Spring is in the air. Yes, even in snow riddled Minnesota, you can just feel that spring is coming any day now, I swear it. Okay maybe it’ll take a little longer than I want for the foot of snow that was just dumped in my backyard to fully disappear but we can at least pretend that spring is here with our clothes. Nothing gets me out of my winter is still here funk like some springtime clothes! The pastels, bright colors, cropped pants and shorts! Warmer weather is right around the corner I can just feel it. Despite the fact that Easter Day saw a backyard covered in snow, the warm weather of spring will come and my kids will look the part until that day is here. Where do I go to find the best spring fashions? OshKosh B’gosh! Right now you can save a ton of money sprucing up your kids’ wardrobes. I was able to get three outfits, one for each of my children, all under $50! 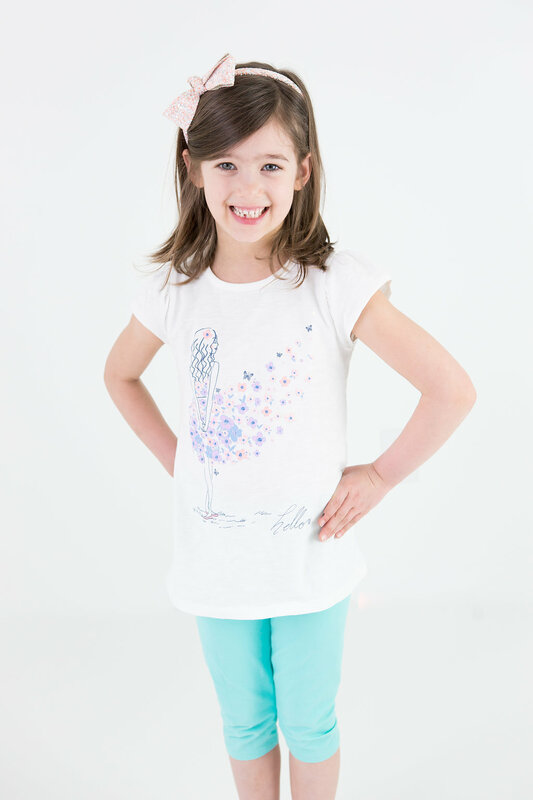 From graphic tees, to soft, comfy leggings, my kids are ready for the sunshine now. I’ll share with you how you can save money too later on in this blog post. My girls love to dance and tumble all over the house. They’re little gymnasts after all and that means they need clothes that allow them to move freely. Thank goodness leggings are in style; I don’t know if I could get my littlest to actually wear a pair of jeans. What I love about these leggings from OshKosh are the colors; pastels are really popular right now and OshKosh have an array of bright, pastel colors to choose from. Look at how easily they can move in these. Keira is constantly reenacting some musical she’s seen, whether it’s Frozen (yes, we’re still obsessed with Frozen) or an episode of Shimmer & Shine, you will see her singing, dancing, and running wherever she is. Graphic Tees On Point – Even I would wear them. I love how Oshkosh doesn’t dumb down their styles. Some kids’ clothes are either too adult or too baby-ish. One of the things I kept thinking about while I was shopping was how I’d wear the graphic tees my girls had. I felt like the tees were age appropriate without being cheesy and the details and embellishments were just enough to show their personality without overwhelming them. For my almost seven-year-old I chose this pretty watercolor tee. I felt like it really fit her girly personality. If there’s a way to dress up any outfit my Kindergartner will find it. I cannot get enough of this sequined rainbow heart and the detail of the tie on this tee. It’s adorable and is perfect for my three year old who’s sweet as can be with a little sassy attitude in her step. Shop for Spring Fashion at OshKosh with this exclusive coupon now! Right now through April 30th, you can save 20% off your $40+ by using this coupon. Use the coupon in store code: 037686 or online: OKBG3434 today through April 30th to spruce up your springtime fashion. Click the image to download the coupon! 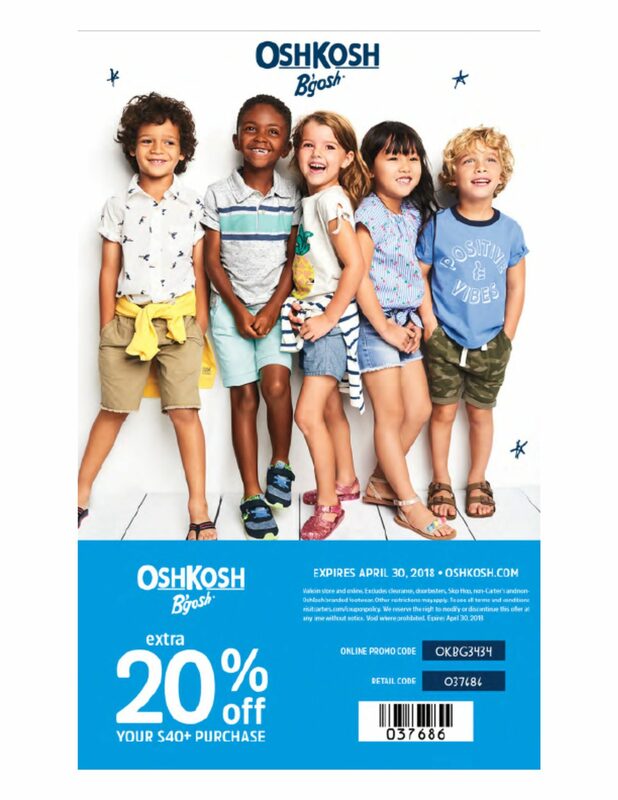 Grab the kids, or no wait, go by yourself if you need a little me time, and take advantage of the savings now at OshKosh B’gosh. You can shop in store by finding the location nearest to you or from the comfort of your own home online now until April 30th and don’t forget to use the coupon for an additional 20% off your purchase of $40+. Follow OshKosh B’gosh on all of the usual social media outlets, Facebook, Twitter, and Instagram for inspiration and general goodness. What do you look for in your kids’ fashion?